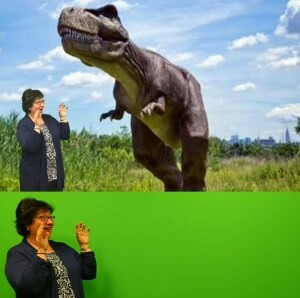 Learn how you can use the green-screen studio at The HUB to make your own videos. Do you want to increase the production values on your YouTube channel or make a music video for your band? The HUB inside Mentor High School has a green-screen studio with all the hardware and software a budding director needs, and it’s available to use for free. We’ll even provide an introduction. We’re hosting two introductory sessions on Monday, April 29: one beginning at 5 p.m., the second at 6:30 p.m. Both sessions will take about an hour. You can learn about the production capabilities of the studio and get inspired for your next video project. The introduction is free and open to everyone. However, due to limited space, registration is required. You can sign up to attend online or call The HUB at (440) 205-6011. 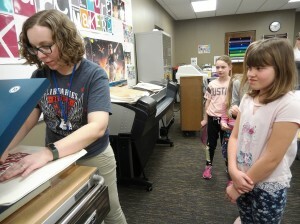 Kids use the heat press at The HUB’s makerspace to make trendy tote bags. In addition to the studio, The HUB’s makerspace also has a laser engraver, vinyl cutter, large-format printer, heat press and more – all of which are available for public use. The HUB is open to all from 3 to 8 p.m. on Monday, Tuesday and Wednesday and is located inside Mentor High School (6477 Center St., Mentor, OH). Just to be clear, you don’t need to be a student at Mentor High School or even a resident of Mentor to use The HUB’s MakerSpace. All you need is a Mentor Public Library card in good standing. For more information – including policies, procedures, and how to make a reservation – visit our MakerSpace page. This entry was posted in Uncategorized and tagged green screen, Makerspace, Mentor Public Library, The HUB. Bookmark the permalink.